Email marketing is the most effective tool for the B2B businesses. There is huge possibility people who are reading this MailChimp email templates list are B2B marketing professionals. It doesn’t mean that B2C model doesn’t use email marketing, they do use it but the conversion result is quite higher on the B2B side. Here is a simple stat, only 30% of the email list customer actually bought products through email, while 86% of the business professional prefer email communication the most to talk and complete a deal. Nowadays lots of companies and service providers let the user create a free account first and try to convert them later. A post from Easy SMTP says, in the conversion process the welcome email alone brings 320% revenue to the organizations. So when you are making your email templates, try to spend more time on the welcome email templates. MailChimp is one of the best and also easy to use tool for both the developers and the end users. 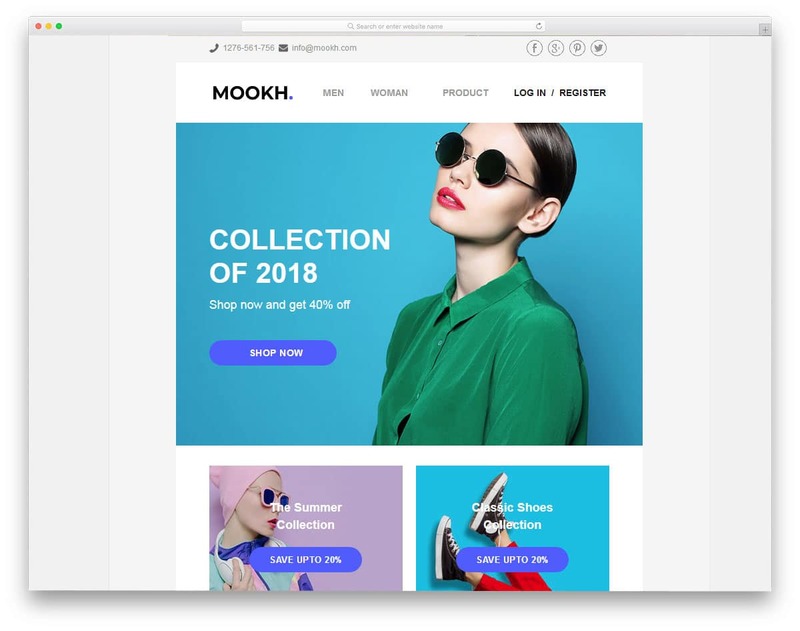 In this list, we have collected some of the best MailChimp email templates, which you can use in your email marketing campaigns or for other transition emails. Though MailChimp itself provides you their own email building tool and email templates to kick-start campaign right away, the modules you get there is limited. The MailChimp email templates in this list also come with their own email builder tools and some of them even gives you 300+ module to create your own unique templates. All these email templates not only work with MailChimp but also work with other famous email service providers. Email marketers will find these premium tools extremely useful for their campaigns. NOVA is a multipurpose email template collection. 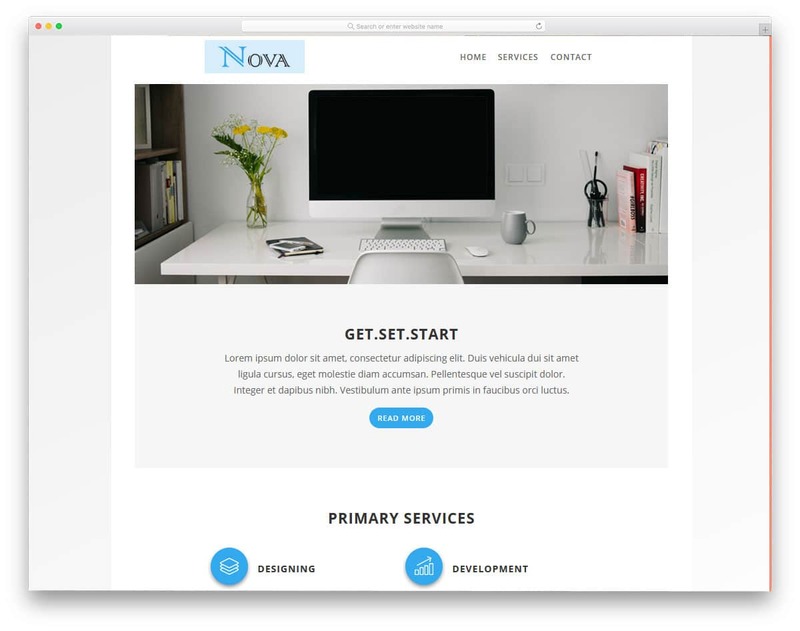 The creator of Nova has given you email templates for most common purposes to save your time. Plus, with this template, you get Stampready drag and drop builder. All you have to do is to pick the template that closely matches your need and start editing on the drag and drop editor. Since it is a StampReady based email templates, all major email marketing tools will support these email templates. All the email templates are responsive and are optimized for all major browsers. 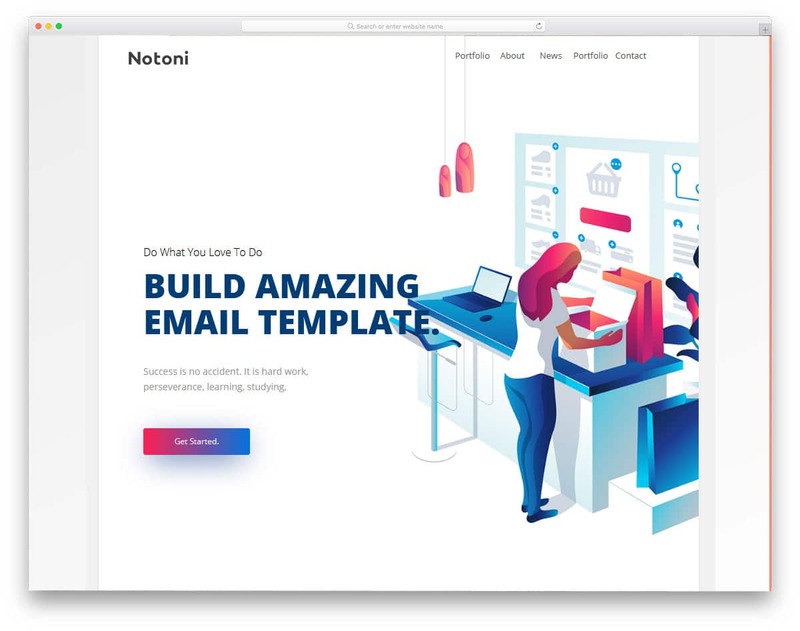 Notoni provides you with four pre-made email templates for general purpose work. In the default design, you get plenty of colorful vector diagrams and characters. If you are looking for a modern email template that attracts the current generation users, this email template might help you. Just like the previous email template, this one also has Stamp Ready drag and drop email builder. Hence, adding the elements you want and linking to the desired features and pages won’t be a tough job. The creator has given you MailChimp and Campaign Monitor support files, to help you easily start with this email template. 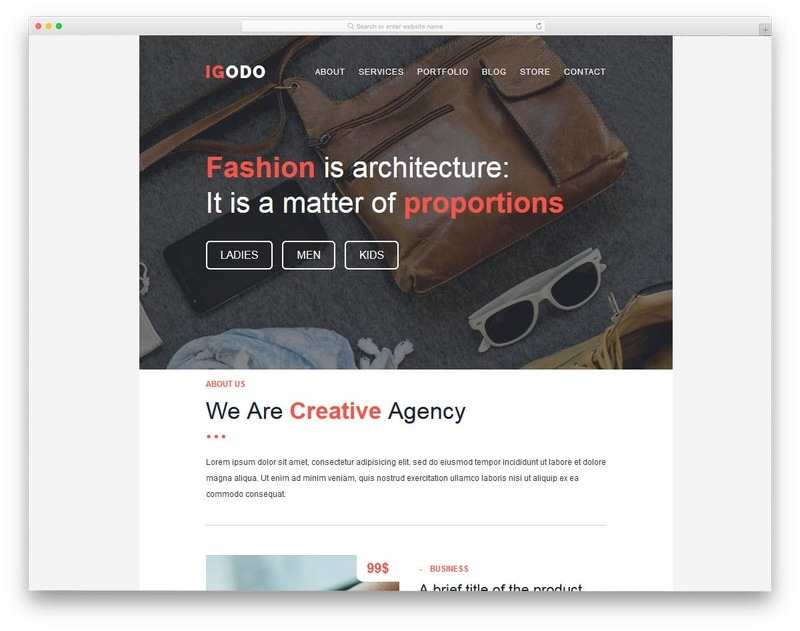 Igodo is a user-friendly and well-documented email template for Mailchimp, Stampready and Campaign monitor. This template is based on the email building concept, just like the page builders, you have seen in many WordPress themes. All the basic elements are provided as modules, you can just drag and drop the modules to create your own email template. The Igodo template gives you 400+ premade modules for you. With its easy to use WYSIWYG editor, you can create your template in no time. 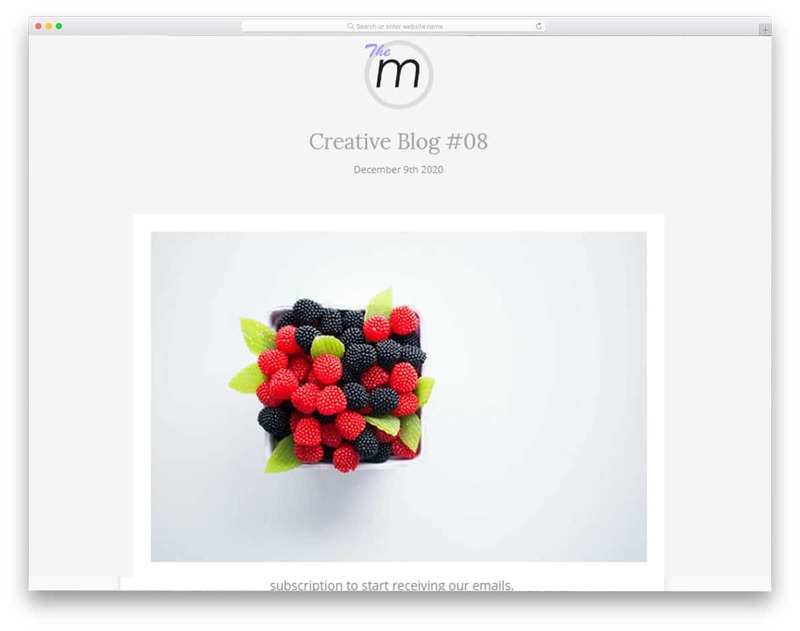 You can download the template and upload it to your MailChimp email campaign. If you are new to this email building tool, the creators of this template have created a tutorial video for you to start easily. With this email builder you are creating a responsive email template by default, so you needn’t worry about making it mobile friendly. 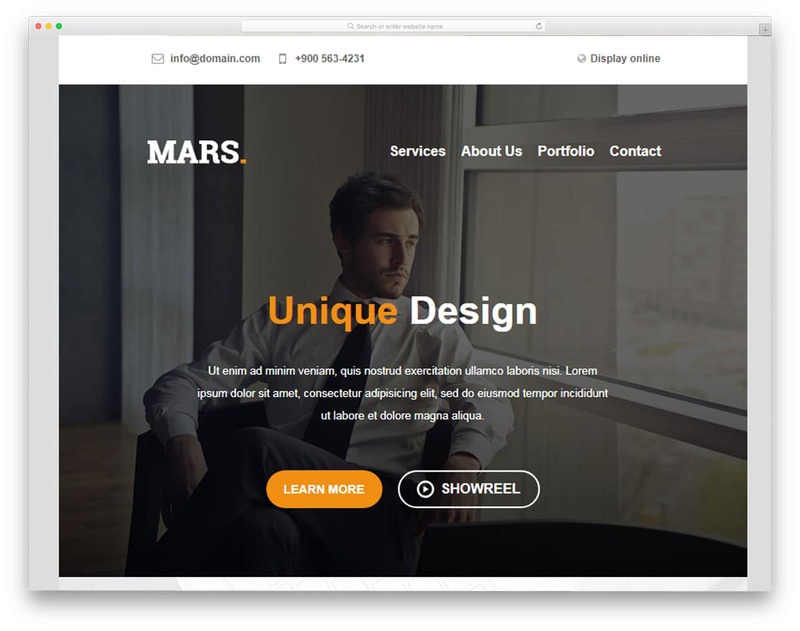 Mars Email is a brand new entry in the email template market. Since it is a new entry you can expect more modern design and user-friendly features. It is a well tested and well-optimized email template creator for professionals. All the templates in this package are tested with the Email on Acid, for those who don’t know about email on acid, it is a platform which developers used to check the email compatibility across all famous email clients and apps. The templates in the Mars Email package is optimized specifically for the Gmail and Outlook. As a result, you get a seamless performance across all platforms and all your interactive elements are shown without any error. In the editor itself, you have options to preview your email in mobile devices so that you can adjust it easily. As the holiday season is approaching all tech giants are busily releasing their devices and eCommerce stores are giving special deals to their customers. If you are an online store owner then the Deluxe is the best option for you. With a minimal design, this kit has plenty of email templates pre-designed for. Even if you want to add your own elements in these templates, you can do it easily using the drag and drop module builder given in this package. All the pre-made templates follow the minimal design so your contents can be easily read and the colorful images will look more vibrant. Hixel email template is designed for digital agencies and creative fresh startups. The designer of this template has followed the trendy design which most of the young entrepreneurs will like. Both promotional emails and action emails are given in this template. MailChimp gives you the option to automate the email process based on the trigger function. 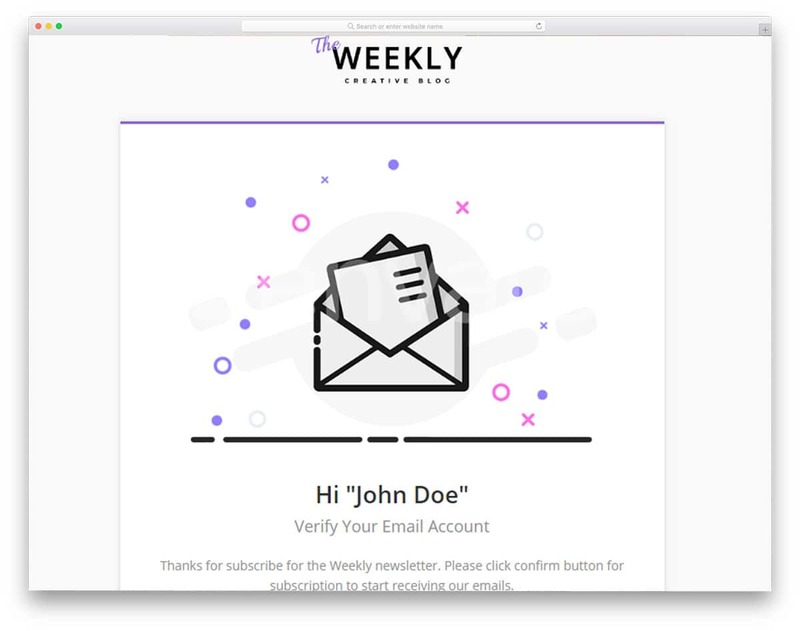 For all basic function like a newsletter, new signup, and password reset, email templates are included in it. It is always better to make the transition email short and sweet, with appropriate links. 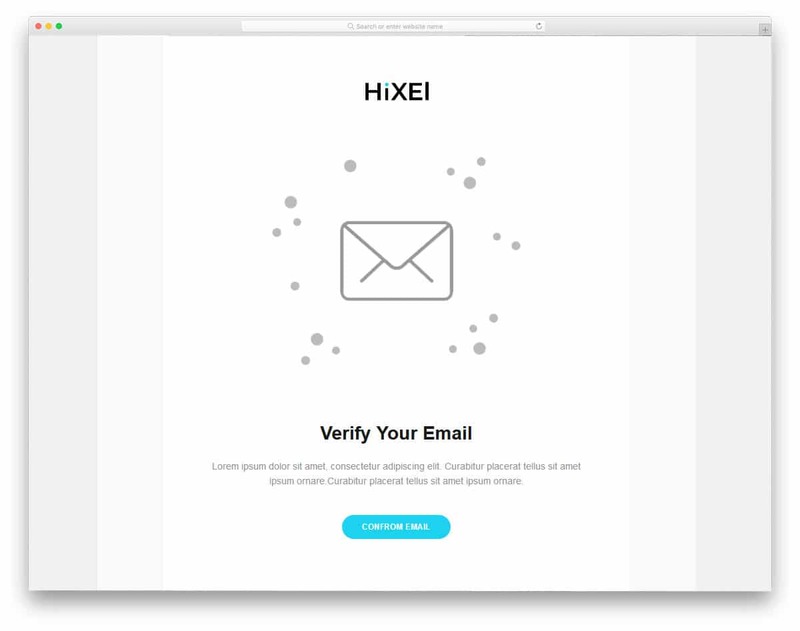 The email templates in the Hixel package are simple and precise on the content. These premium templates not only supports MailChimp but also supports other services like Stamp ready and Campaign monitor. 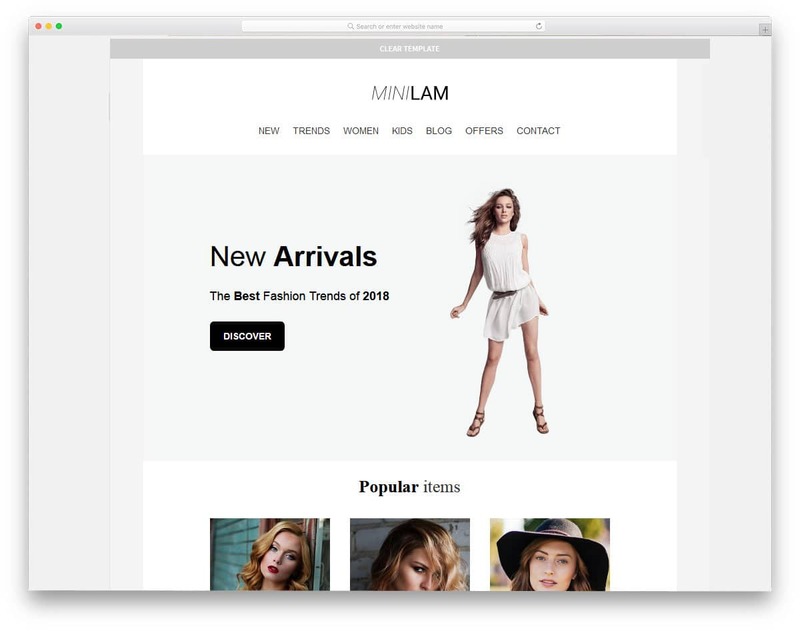 Minilam is multipurpose email template, which has designs for all famous categories and events. This template has neat documentation and how to videos, if you are a beginner, these materials will help you start easily. Just like all other email templates in this list, this one also includes a drag and drop builder. MailChimp email templates allow you to easily upload the custom template, you can create your custom template with this builder and can upload it to the MailChimp email editor for further optimizations. Since this template is designed for multipurpose use, it has plenty of images in its templates. If you are expecting a better click-through rate, try to use images only at the required spaces. As most of the modern users open the email on their mobile devices, using too much of images will look clouded on their mobile screen. 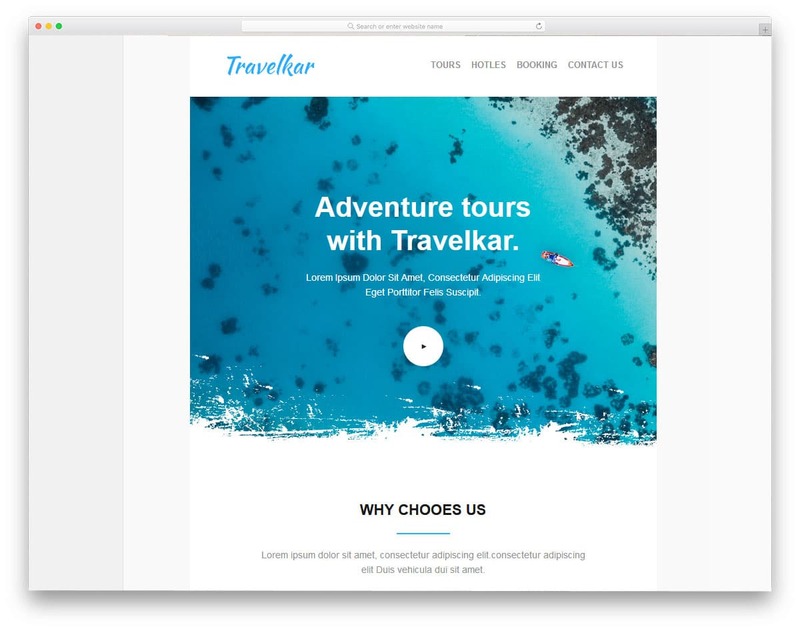 Travelkar, as the name implies this template is designed for the travel agencies. Travel agencies and restaurants have an exception from the use of images in their emails. It is through the images you can give the feel of the place and foods to the users. As vacations are coming nearby it is the best time to start your email campaign, because the email open rates during the holiday seasons will be reduced up to 20% so make your move yours as soon as possible. To speed up your process you can use the Travelkar template. All the templates are properly optimized for all major email providing services and top email marketing tools like Mailster, Campaign monitor and Stamp ready. Typography is also treated as a part of the modern design. People can clearly see the contents and you also can elegantly highlight the important contents. As most of the user glance and skimm the contents of the email, highlighting the important points will buy you some more time to engage the users. Trendy color schemes are used in this template, which will look more lively on the modern mobile screens and monitors. As video contents perform better among the present-day audience, these templates give you space to add video contents. Since this kit also uses the email builder tool, you can easily add a video or video link to the email easily. Ample amount of space is given between each element so that the user can interact with the email easily and avoid accidental clicks. 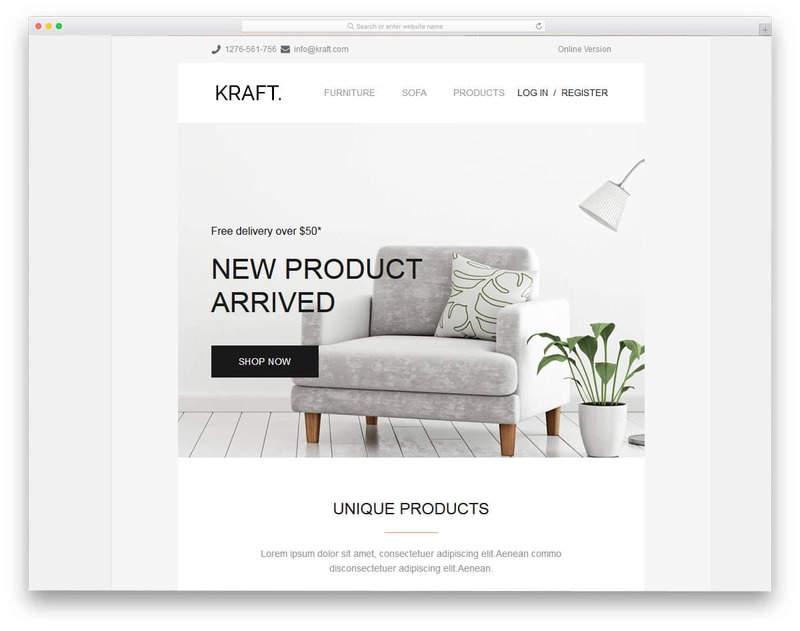 Kraft email template is designed primarily for interior designers and furniture stores. Since this template is designed for a creative field that gives an elegant look to our house, the templates are also designed in such a way. With minimal design and light patterns, this template makes your email look elegant. The subtle design of the template will make your contents bold and clean. Each email is treated as a mini website with important website page navigation links at the top and the contact details. The grid style design helps you to showcase some of your best new collections. Call to action buttons are placed at the appropriate places to increase the chances of getting the reader to your website. 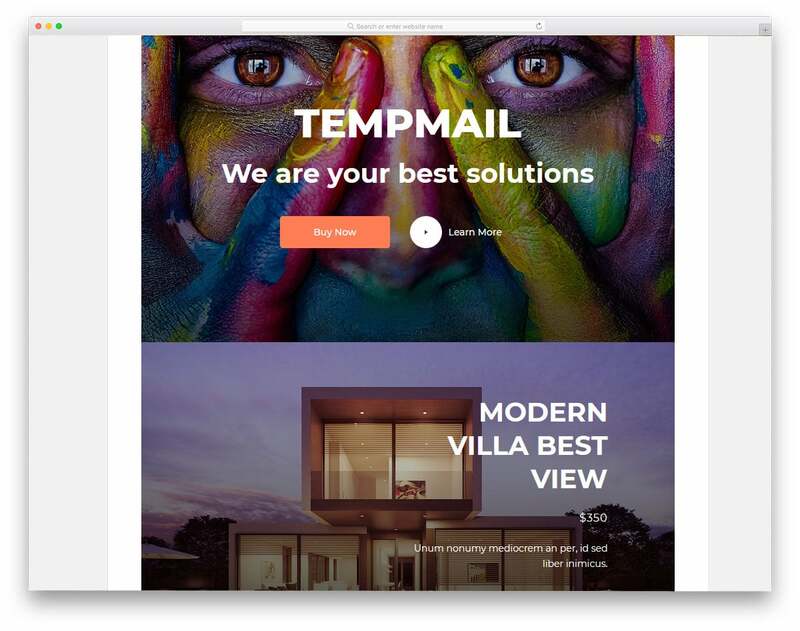 For the flat style design lovers, the Tempmail is the best option for you. All the elements and the modules used in this template follows the clean flat design with a flat color scheme. Image banners of all size and orientations are given so that you can engage your readers with interactive contents. The creator of this template has added elements for almost all major purposes, all you have to do is to pick the elements and place it in the place you want. Icon set given in this template is related to the technology. Based on your purpose you might need to change the icons. Other than that this template is easy to email template for all purposes. 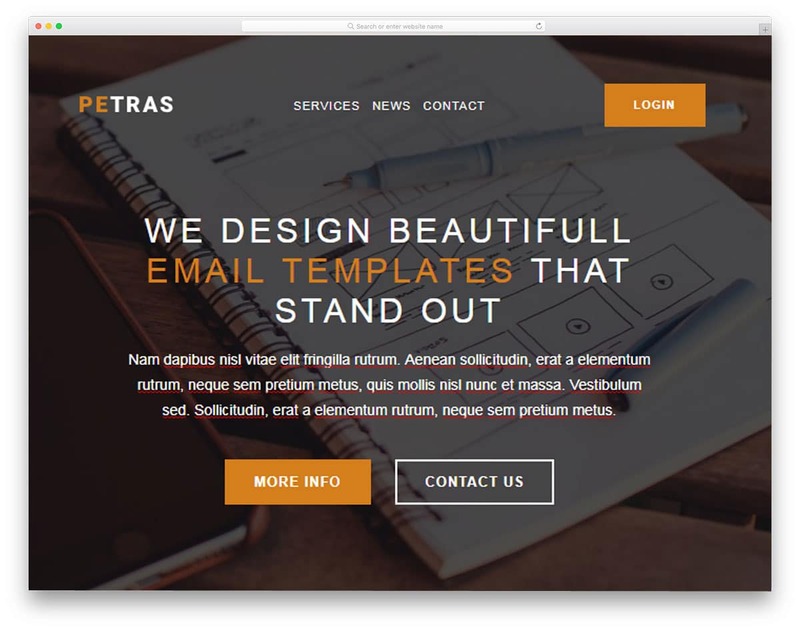 Petras is one of the best selling MailChimp templates. This one-year-old email template has impressive sales count, which is the proof of its quality and useful features. The Petras includes fully customizable email templates. Two hundred plus modules give you an unlimited possibility to create your own custom email template without even dropping a sweat. Well coded modules do not create redundant tags, so the emails load faster in all types of devices. Other than the modules the Petras also includes premade templates for all famous niches like restaurants, travels and business. If you are in a hurry, you can use these templates as such without making any changes, as all the templates follow the perfect email design standards. Denise email templates are for the minimalism lovers. With the simple design templates, it helps you to create laser-focused contents without any distraction. The logical alignment of the sections is followed neatly just like in the landing page templates to increase the click-through rate and the conversion rate. The Denise template gives you 110+ modules premade for you, in which you get almost all basic and advanced options covered. Along with the layout, you also get twelve premade templates, so if you are in a hurry you can make your templates in no time. Compatibility is the strongest point of the Denise template. This template is compatible with more than thirty email tools and all famous email service providers. 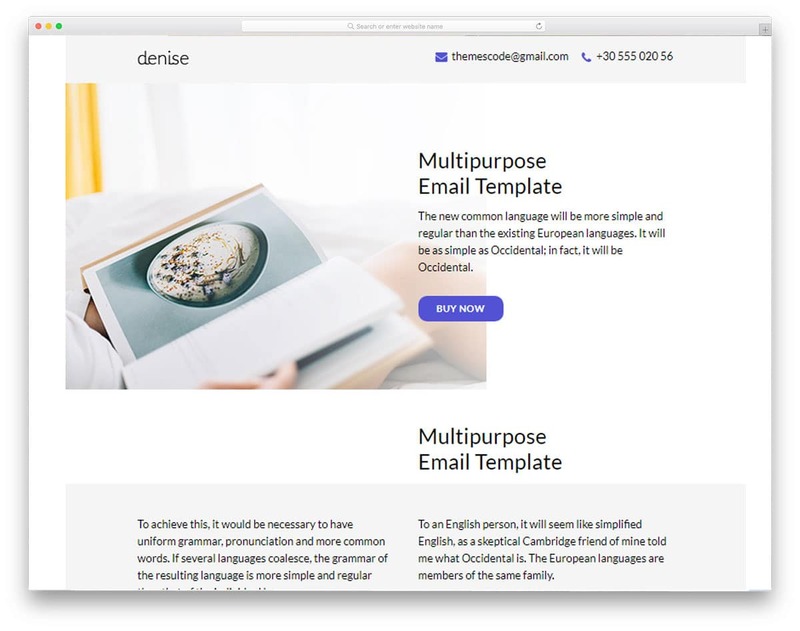 Overall the Denise is a value for money tool, if you are a marketing agency and use many platforms for your email campaigns, then this the template for you. Mount mail is one of the best email template creators for marketing agencies. With more than 300+ modules this builder helps you to create almost any type of email template. The intuitive email builder helps you to create a pixel perfect design without even typing a single line of code. 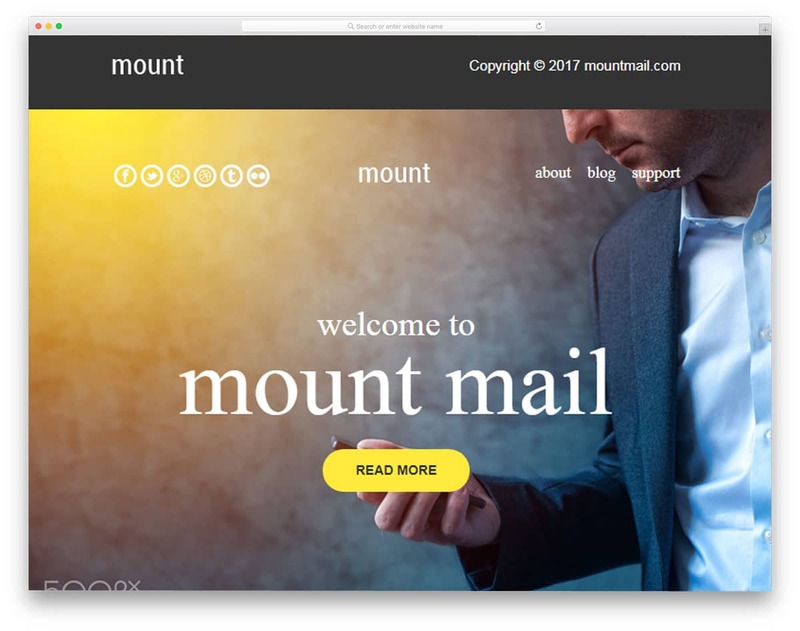 Any creative designers without coding experience will find this Mount Mail package extremely useful. This builder uses a separate control box on the left, based on the element you choose the control option changes. Some inline editor fans will find it quite annoying, but this approach is clean and help you preview your template without any disturbance. With this builder also you get only the modules and no premade templates. But the demo modules include elements for almost all famous niches. Out of the box, this mail builder is compatible with MailChimp, Stampready, and Campaign Monitor. 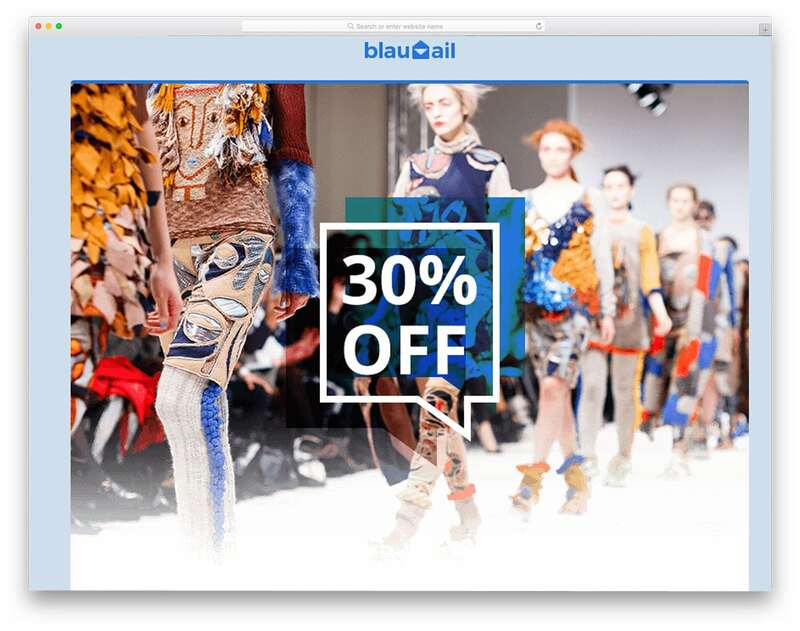 BlauMail is one of the best selling email templates in the market. With over 4k+ sales this template still remains one of the go-to options for email template creators. This template gives you a package of nearly twenty premade templates. The premade templates include design for almost all scenarios in the business, plus you get Stampready builder integrated into it. With the Stampready email builder, you can create an interactive email in no time. It has a numerous number of blocks pre-built in it, all you have to do is to drag and drop the modules to create your own email templates. All the templates you create using the Blaumail are mobile responsive. 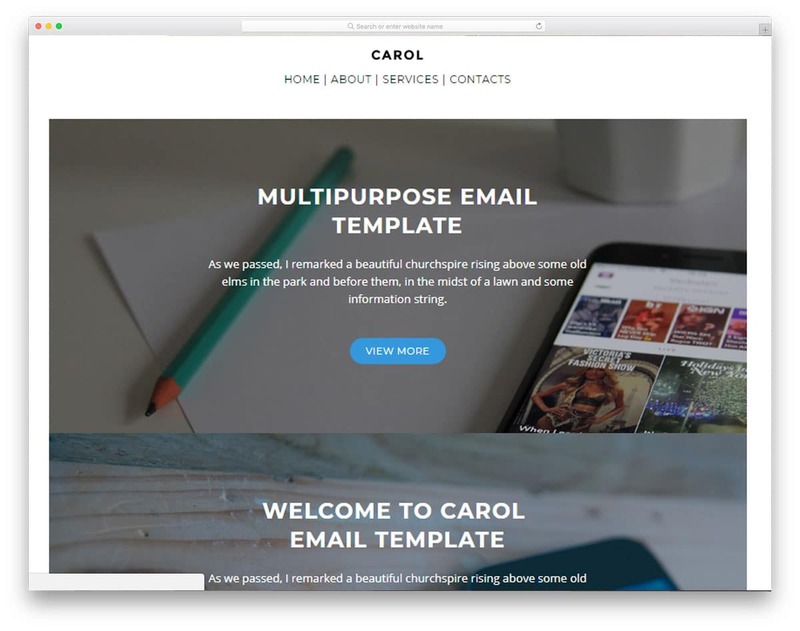 Carol is a quite famous email template builder out there in the market for more than a year now. With the recent updates, this template brings you even more options and a stable structure. The unique feature of this template is it has 100+ module to help you create an interactive email. The stampready editor gives you a friendly user interface, which you can use it straight away by having an overview. This template is also well documented, which gives a step by step instruction. So adding and editing template will be an easy job even for the beginners. Though the Carol does not include any premade templates, the modules given are created for almost all famous niches. 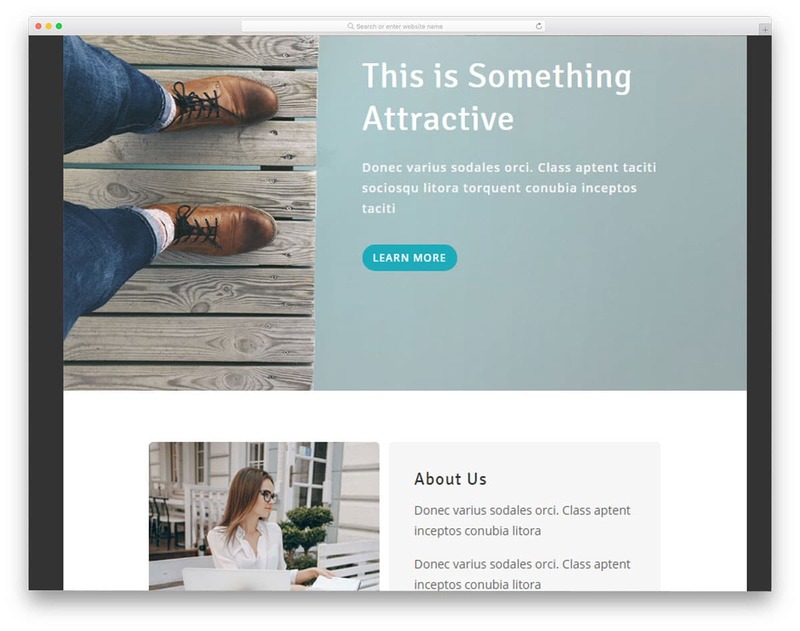 By default, the templates you create with this builder are responsive out of the box. Marquez is another minimal theme based email template just like the Denise template mentioned above. This email template also comes with the stampready email builder as you have seen in some of the MailChimp email templates mentioned in this list. The builder is designed smartly so that you can edit almost all elements without any worries. Editing options are shown in a separate control panel section shown in the left sidebar. The Marquez template gives you seventy plus premade section to make work simpler. This template can be integrated with famous email service providers like Campaign Monitor, Mailster, MailChimp and StampReady. 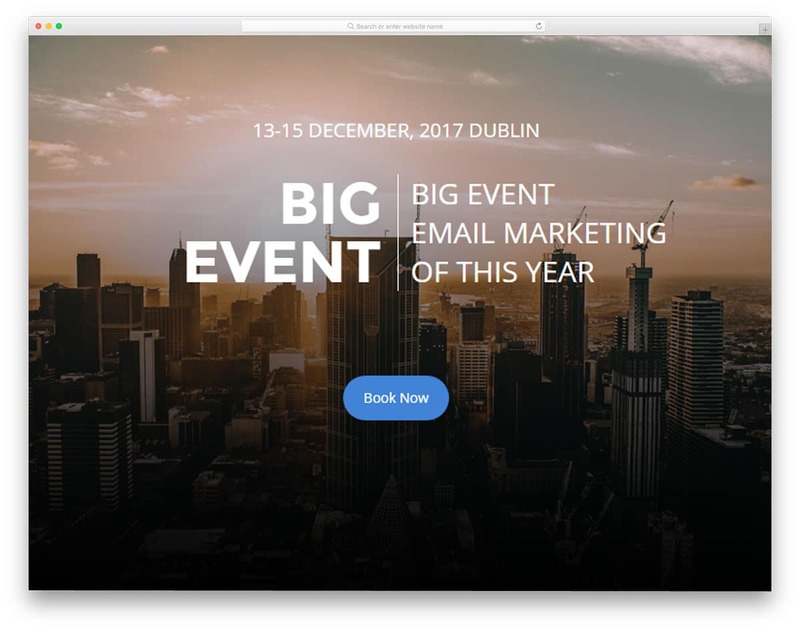 As most of the backend functionalities are already taken care by the creators of this template, all you have to do is to create an interactive email template for your campaign. Notify is a complete email template package. With this package, you get premade email template, email builder for editing it easily and PSD files. This email template follows a vector based design, with the PSD files you get all the line vectors and icons they used to create these awesome templates. Just like in the mockups the icons are given as editable smart object so that you can customize it easily. Speaking of the email editor, you get 30+ modules premade for you. The editing options are shown in the left sidebar, the options included helps you to customize almost every aspect of the elements. The premade templates include almost all types of email you might normally need to run your business smoothly via email. If you have any other special purpose you can use the email builder to create one. Miley is also from the creators of the notify template mentioned above. With the Miley template also you can expect the same design quality and user-friendly features. The templates used in this package also follows minimal design. Default templates are given in this template best suits for design agencies and interior design companies. The template uses the typical minimal template design with dark and light color scheme. The editing options are shown in the left sidebar under different categories. Yet the user interface is not so great as you get with the Stampready editor. The unique feature of the Miley template is the premade templates, you get 30+ premade newsletters with this package, all following the same minimal design. 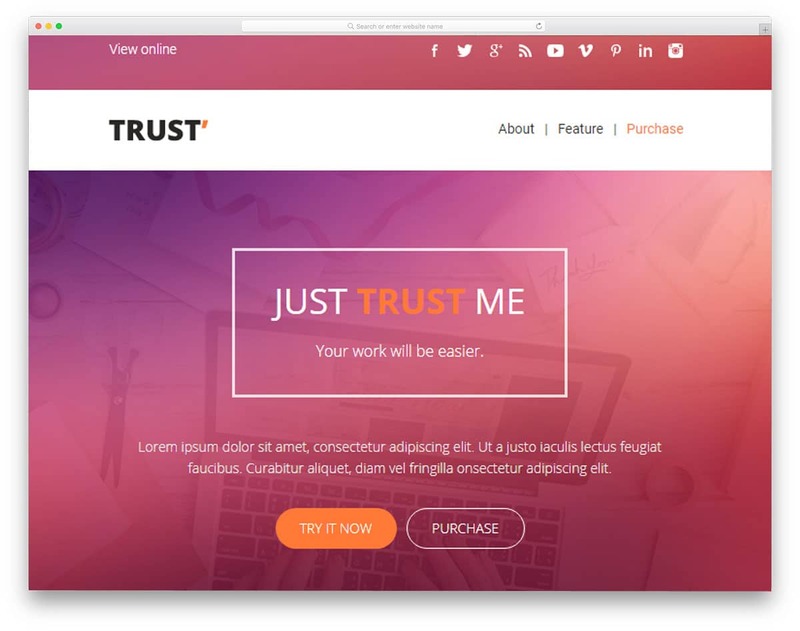 Trust is a simple and clean looking email template creator. This email template creator uses Mailbuilds builder, which gives you twenty-four unique modules. All the modules are extremely customizable so that you can create your own custom email template in no time. Most of the email builder mentioned above either uses an inline editor or a control panel like structure. This mail builder uses a quite outdated user interface. The text editors open in a separate lightbox just like you have seen in the visual composer. Other than the user interface, the features you get with this template are useful and it is also easy to use. With this email builder, you can create a simple modern email template easily. 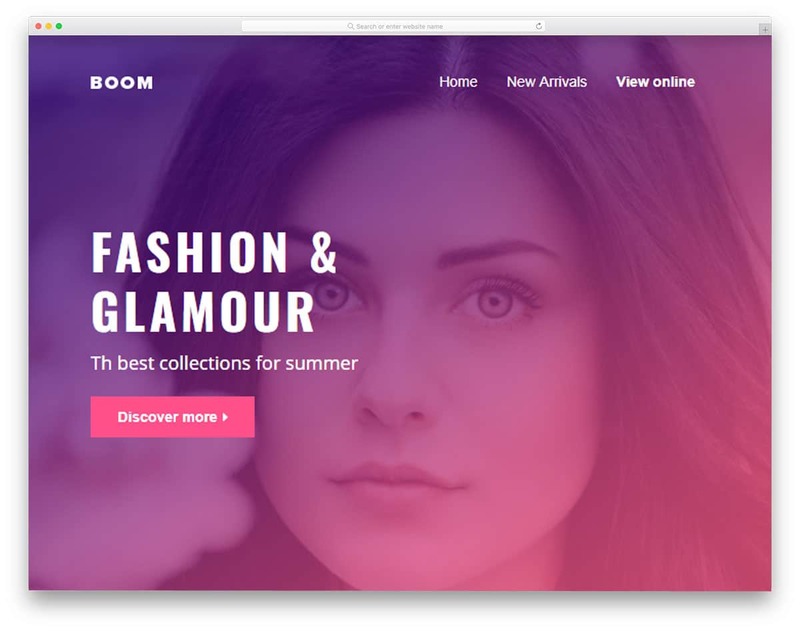 Boom is a simple email template builder, which also gives you live editor to create an email template. This template package gives you only a handful of twenty-six plus modules, which is pretty less than other email builders for almost the same price range. The inline editor works flawlessly so that you can add and edit texts in no time. Email templates are checked and compatible with famous email service providers like MailChimp, Campaign Monitor, iContact, and Aweber. Just like the Mars Email templates, this one is also tested with Email on Acid to ensure seamless performance across all famous email applications and platforms. If you are moving from free email templates category to premium, you might find the Boom useful. But at the same time with one or two dollars higher you might get email builder with more modules and options. 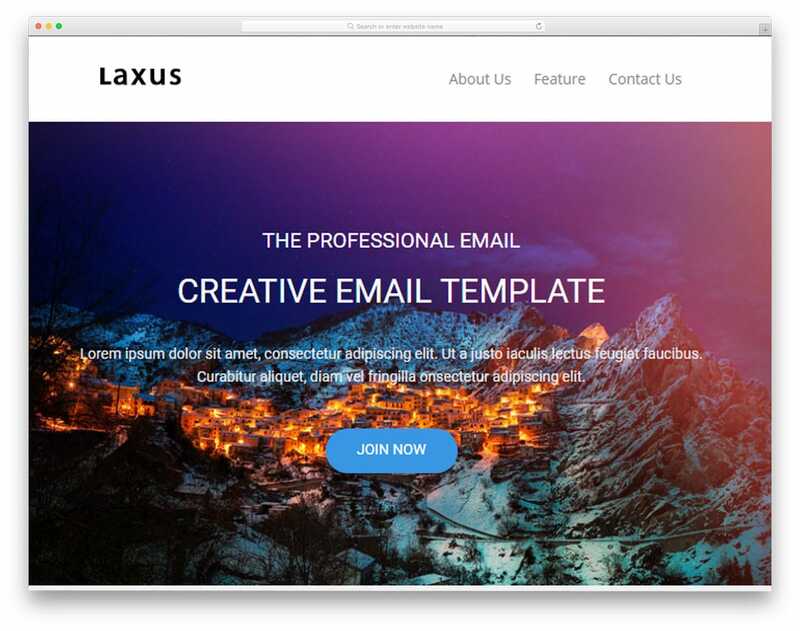 Laxus uses MailBuild tool to help you create email templates in no time by just dragging and dropping the blocks you need. With this template builder, you get only modules, there are no premade templates like you have seen in some of the MailChimp email templates mentioned above. Another small bummer with the Laxus email template is it has only thirty unique models with this builder. The thirty module includes all the necessary features and option you would normally need. Other advanced interactive elements are not available with this email builder. Once you completed, you can simply export the template and upload it to the email marketing tool you use. The laxus supports all famous email platforms and email marketing tools. 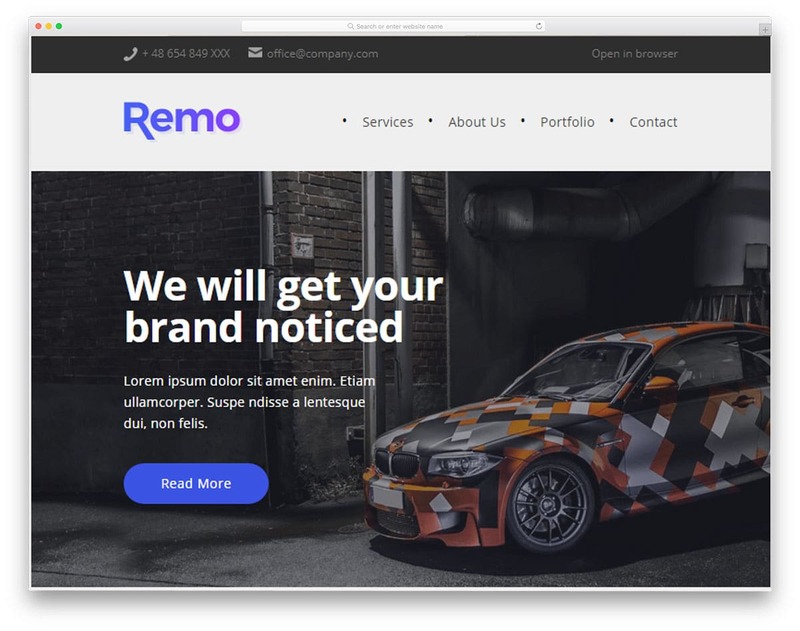 Remo helps you to create a multimedia-rich email template. The remo gives you modules to create your own template using the Maesto mail builder. The email builder used in the Remo is clean and simple to use. The user interface might remind Visual Composer page builder plugin for the WordPress users, hence the learning curve to use this template is not difficult. One useful feature in this editor is the global option, for example, if you want to use the same color for all call to action button you can use this Global option, it saves your time. The small downside of this template is the number of modules. Though it has all the basic module, for the price mentioned you can buy other email templates with more than two hundred and three hundred modules. 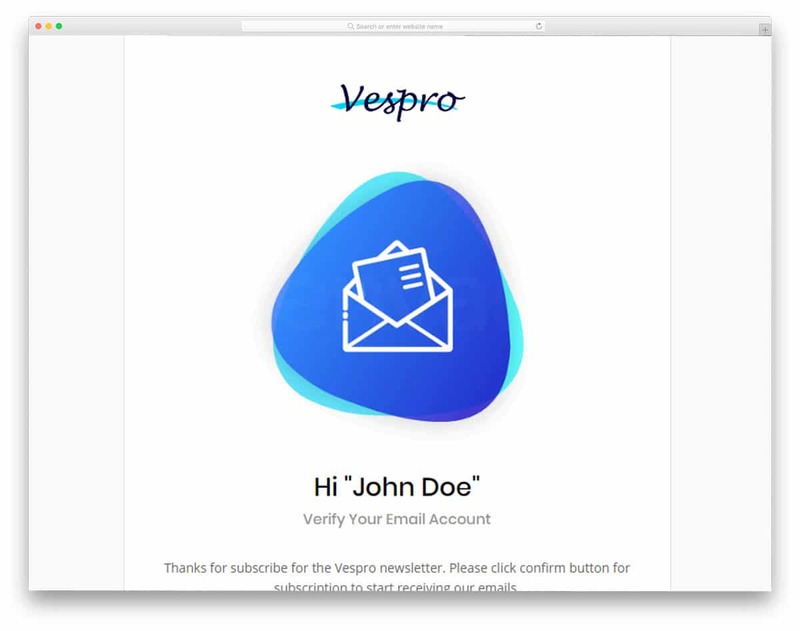 Vespro is the colorful version of the notify email mentioned above. This package also includes all types of transitional emails premade for you. Transition emails are the one which has a high open rate of above 47%. Since these are the emails that perform well, branding it properly is a must. These templates also come with a custom email builder to help you customize the templates easily. The creators of this template give you thirty-five plus premade templates, from which you can customize and create your own template. All the templates are tested with litmus, so you needn’t worry about compatibility issues. It supports all famous email service providers like MailChimp, mailster, and Campaign Monitor. 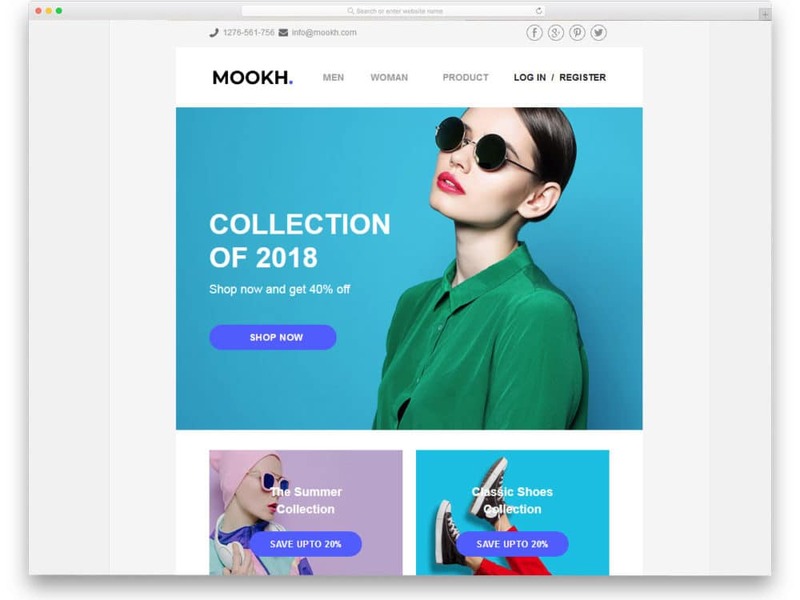 Fashion and eCommerce, as the name implies these email templates are made for eCommerce stores and fashion stores. eCommerce and real estate industries are the one which uses both social media marketing and email marketing effectively. If you are a store owner, you can use these email templates as such without any changes. Like most other MailChimp email templates in this list, this one also uses stampready email builder. With more than fifty modules you can create an effective email template easily in minutes. Another plus point with this template is the author of this template promises to give new templates every month. If you already owned this template, please share your experience in the comments section so that other readers will get benefited. 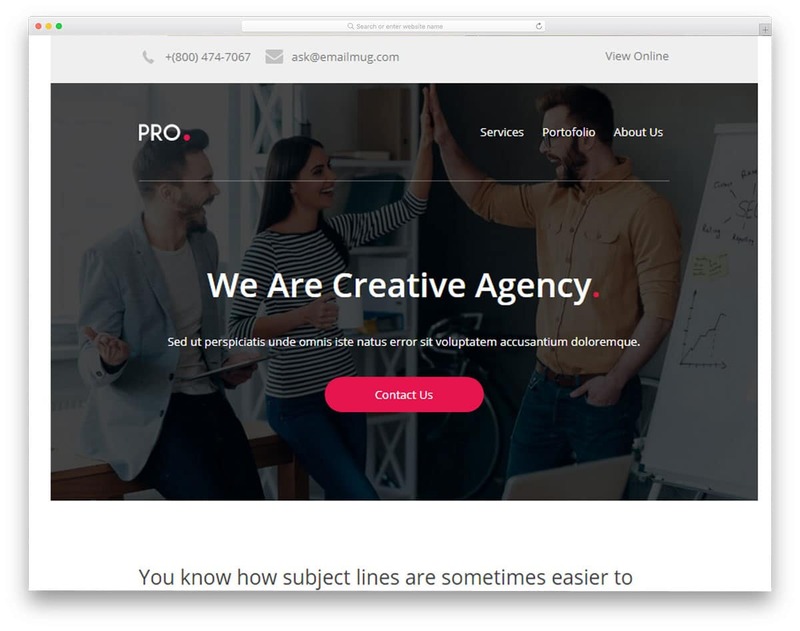 Pro is a niche focused email template for startups and other businesses. The simple clean design and neat color scheme used in this template meet the current design trends. Even if you need you can customize these elements easily using the Stampready builder given along with this email templates. Debuting its entry in the last month, this template gets regular updates, which is a good sign for a professional product. The templates made with the Pro template is compatible with MailChimp, Campaign Monitor, and Stampready. 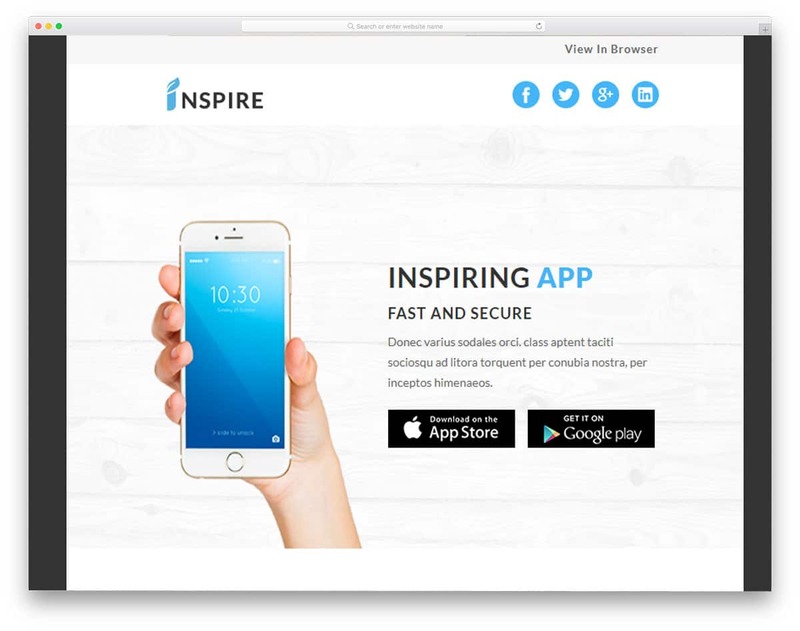 Inspire will help you create a simple professional email template. Though this template uses stampready email builder, the modules and options you get with this one are limited. If you are looking for a professional email template or template for consultancy business, then this one is for you. The editing option is similar to all other email template mentioned in this list that uses stampready builder. Customization options are limitless with this template, you can do all sorts of customization works easily. The only downside of this template is the pricing, for the same pricing you get email template with more options. Please compare this template with other templates before making your purchase. TRAMAIL is a fully customizable email template. Though this package doesn’t give you many templates, in the stampready email template the creators have added 250+ modules. You can use these modules to create your own custom email template effectively. The modules include both media-rich elements as well as simple elegant modules with neat bold texts. Templates in this package are tested with email on acid, so you needn’t worry about its performance in different email services and applications. Overall you can use TRAMAIL as a base to create your own custom email template. Lite is another minimal design based email template in this MailChimp email templates list. This template gives you fifty plus modules to create a simple yet beautiful looking email templates. On the minimal clean design, the contents look clean and clear. 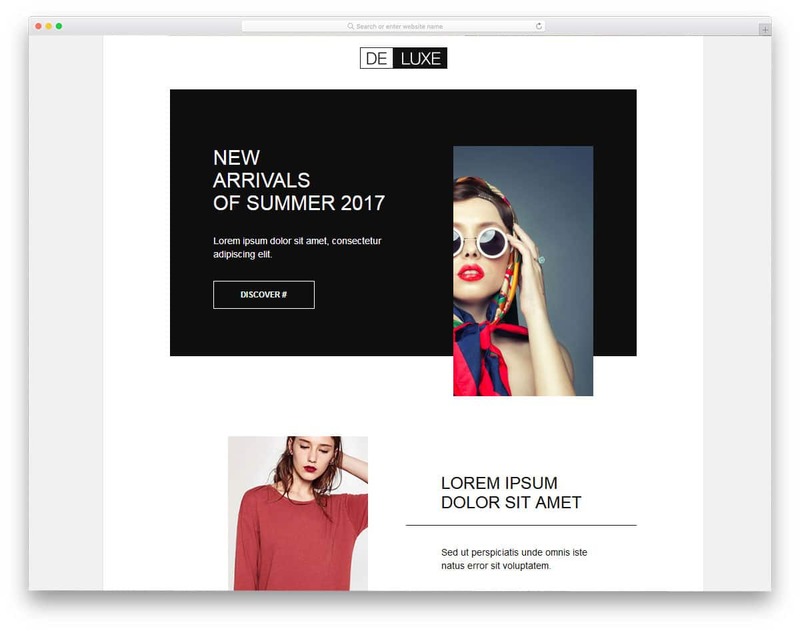 If you are a design agency, your work will look visually appealing to this email template. The Lite uses stampready email builder, so you get a user-friendly interface with more customization options.